This was going to be a tutorial, then turned into a review, but the site limits the number of pictures for a review. So I will call this a “suggestion”. 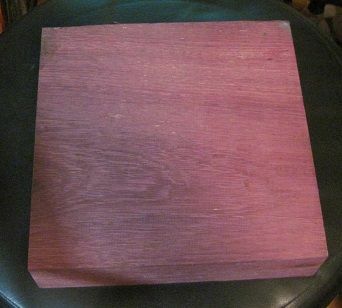 I pulled out a Purple Heart turning block and prepared it for turning a bowl. 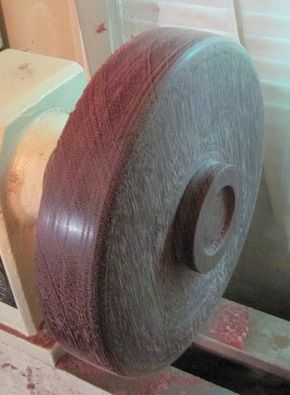 I started turning, first with my roughing gouge then changed over to my oval skew. (personal favorite) When it was time to start the inside and rim of the bowl I decided to try out a brand new tool. I bought this tool a few years ago with a gift certificate I won on a turning contest. I just never tried using it until now. The new tool is the Rockler full size round carbide turning tool. $100 bucks at Rockler. First the good news, I actually like the rubber coating on the back end of the handle. I might just get some Plasti-coat and use it on the handles of all my turning tools. Now for the bad news, this tool does not perform well at all. The carbide didn’t hold an edge at all. 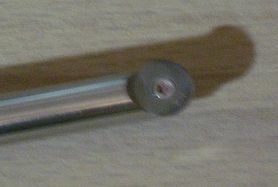 The flat back of the shaft is too narrow to stay flat on the rest, the tool wanted to twist and catch during use. Another downfall is the fact that each of Rocklers carbide tools are made for one specific shape of tip, round, square, or diamond. At $100 each it adds up quick. With the performance I had with this tools I put it away and pulled out my old Sorby hollowing tool. My Sorby allows me to use any shape or size tip I want. I have quite a few purchased tips of both carbide and HSS as well as a bunch of home made tips that I make myself when needed. I have to recommend against the Rockler carbide turning tools, and suggest anyone wanting a good multi tip tool to look at Robert Sorby or make their own. I did finish the bowl without Rocklers help. Does the Sorby have more control due to the flattened shaft? I’m not a huge fan of carbide but some folks do wonderful work with them. 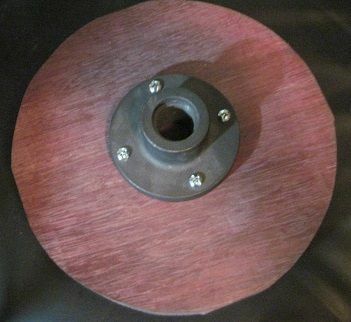 I have a round carbide from Rockler that I have never used. Bought it because it was a wunntenbut…no handle but it wuttenbut $20 for the bar, two screws, and two cup style cutters. Your cutter appears to be flat. I have a square one I made and I don’t think it matters if the bit is recessed or not, if the square one turns then why doesn’t the round one? 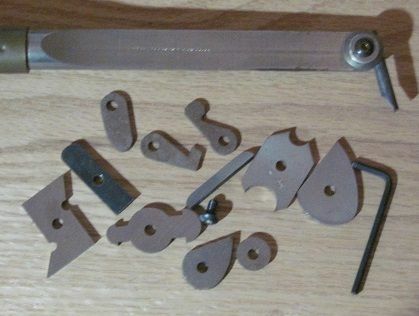 This is the type cutters which came with mine which fit the Hunter or Harrison. I like my Sorby also. Do you use yours with the tip exposed as in your pic? I normally used the round end cutter and expose only about 1/16” unless I am working under a rim. Can be a pickle if shaving gets jammed but that is not too often. The square end or box would, by default, almost have to have more exposed. Yes Lew, easier to control. LeeMills, I like my Sorby because I can make and use any shape or size tip I want. The Rockler cutter is flat. I have that Rockler full size carbide turning tool also. I don’t use it very much but did find it performed well once I got the hang of it. Definitely wasn’t like using traditional tools but I am far from an experienced turner. At first I had a lot of issue with it rolling also but after a little while became a non issue. The rolling I experienced was purely user error and getting the cutter in too deep. It really will get away from you and try and eat some wood if you start to engage too much of the cutting edge. Square back would help counter the effect and know that some like to flatten the back slightly and ease the edge similar to what Carter has done with their Axe line. Once I changed my approach it wasn’t an issue and I could transition to an angled sheer cut with little effort. 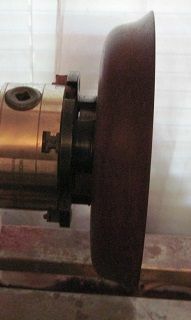 My Dad inherited a lathe and picked up a set or carbide lathe tools and can use them where as he can’t use the traditional turning tools. This is similar to my experience with a class I took. The instructor had us try out carbide cutters. Almost every individual that had turned very little took to the carbide with little issue. He said that was the norm based on his experiences. I had not been turning very long but had the worst time with them and was more than happy to pass them to the next guy. I learned with a set of Buck Bro. tools, the roughing gouge is still my choice for beginning a new piece. Then most of my turning is done with a Sorby oval skew and a bowl gouge. I just picked up 2 sets of old Craftsman tools from an auction. Might have to try them out before putting them on C list. I think maybe the control issue is why Rockler put the rubber coating on their handles. 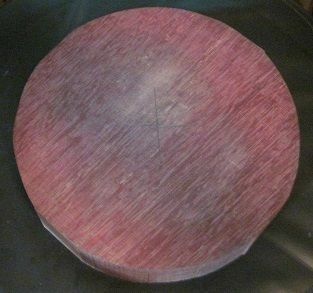 Hi Dan, one of my personal favourites, purple heart. 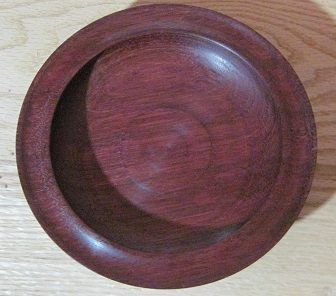 The bowl came out very well. All my turning tools are Henry Taylor, they are pricey but for the work they do I feel happier to rather use a quality tool. I have seen that scrapers can be sharpened on both sides and it is called a negative rake scraper, I did that to one of my scrapers and it works really well. Thanks for sharing the info and your project. I think maybe the control issue is why Rockler put the rubber coating on their handles. Very likely, mine has just a plain wood handle. I will have to bring it down off the wall and give it another go as it may have been over a year since it last use and have a lot more turning experience since then. I have looked at the Sorby a few times just never has made it home yet. I ended up making a few hollowing tools (Kelton inspired) and for small items have worked well that has held me over but only a matter of time.